"This boat is going to change our lives!" 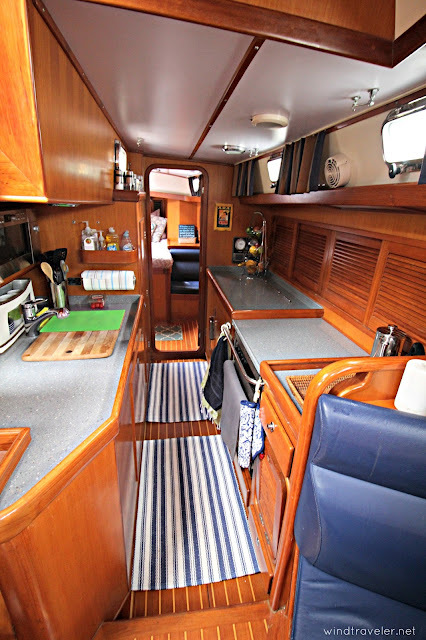 I exclaimed as we stepped on board the Tayana 48 that we would put an offer on less than 12 hours later. Scott looked at me with wide eyes, "Um, I think you're putting a lot of pressure on this boat..." he started tentatively. While, yes, I probably was putting an undue amount of weight on the effect of a boat on our life, but I truly stood by what I said and I repeated myself: "Scott, this boat is literally going to change. our. life." He shrugged and shook his head as we continued lifting up floorboards and digging through cupboards. But I knew it: this was the one. 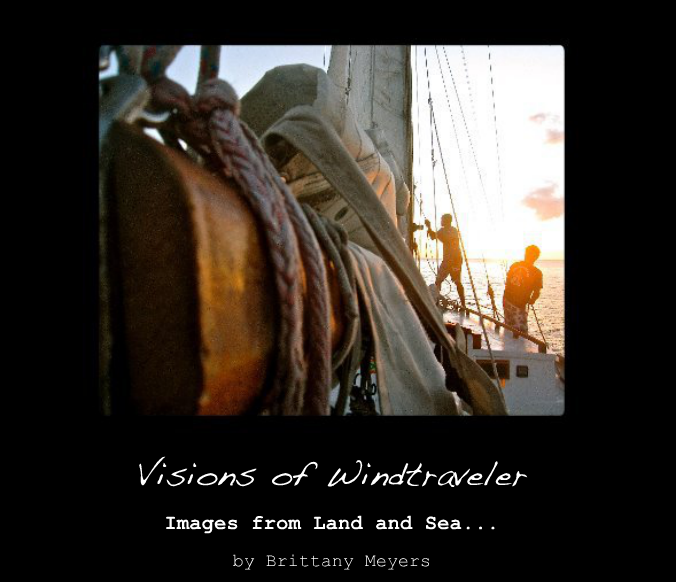 I'd been eyeing her on Yachtworld for about five months and looked at the listing no fewer than 200 times, memorizing the specs and committing to memory every square inch of her. She was absolutely beautiful, checked off just about every item on our "wish list" (more on this later) and, gosh darn it, she was going to change life as we knew it. I could feel it. The bottom line is this: while Asante was working for us, she wasn't really working for us. 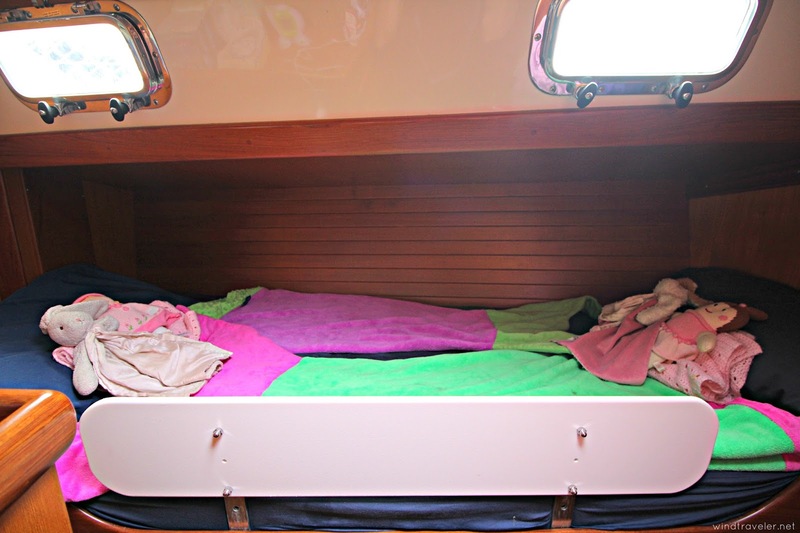 Because of our two cabin configuration, and the fact that Isla slept more or less in the main cabin (on a make shift bunk that is smaller than a toddler bed) meant that once bedtime hit at 7:30pm, our boat was in shut-down mode. At anchor this arrangement was better - as our cockpit became a veritable outdoor living room and extension of our home. 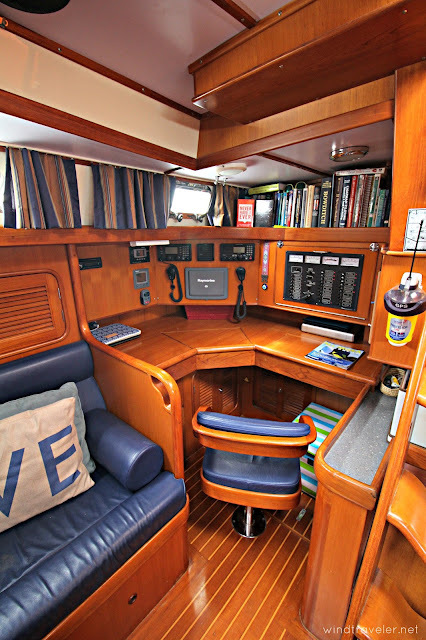 However, at the dock the cockpit simply does not get utilized as much due to the fact that a) there is a remarkable lack of breeze at our marina and b) being so close to your neighbor doesn't have quite the same appeal as sitting on deck being surrounded by open water. "Something about being in a marina makes a boat feel smaller" my friend Carly wrote as we chatted about it. And I 100% agreed. It most certainly does make a boat feel smaller....And since we will be living aboard at a marina for the foreseeable future, something needed to change. Not being able to cook, converse or do pretty much anything other than whisper and go our separate ways was taking its toll on our life in more ways than one. Scott and I are what I like to call a "perfectly imperfect" pair. Okay, fine, we're downright volatile at times (I mentioned how I'd be honesty bombing you, right?) Don't get me wrong, we are an amazing team in both boating and parenting and we can accomplish a lot more together than alone, but our union is far from perfect which may or may not surprise you. Part of this is due to conflicting personalities and stubborn natures, part of it is simply this "season of life"...The last two years have found us drifting farther and farther apart. With three kids, two of them being twins, and the purchase of a new business, we have both been up to our eyeballs in everything but each other. I tend to the kids and housework, Scott runs our business. For the most part, we pass like ships in the night and can go days without really speaking about anything other than work or kids. We have not had a "date night" in years. What is the point of me telling you all this? Well, we needed a change and we figured, why not buy another boat to fix our problems? Ha! Just kidding, that was not our thought process at all. BUT...we did have some serious discussions about our future, we both made a commitment to work on our marriage by carving out some together time and we both decided that, yes, a bigger boat *might just* give us the space to be a little more comfortable, provide the means for a little more quality time, and allow us more privacy together. 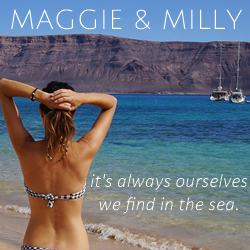 Running a business and raising three very boisterous young daughters in a two-bedroom boat was getting tight at best, stressful at worst - and more breathing room was in order. "What do you think about flying to the east coast for a day to look at that boat I sent to you earlier?" I asked Scott over Whatsapp one day this summer while we were home at my mom's house. To my great surprise, he replied "Sure" (Scott is for sure the more pragmatic of our duo). And so it was; we had a 48 hour window between us coming home from Michigan and Scott heading back to Tortola to make it happen. It was rushed, it was nuts, but we did it and with Isla in tow (you have never seen a little kid more excited about getting her own "big girl room"!). We covered three states and saw four boats in less than 24 hours. The Tayana 48 - the one that I knew was 'it' and the one I was certain would shine above the others - was last to be seen. When stepped aboard s/v Legato on that gray, overcast day in Connecticut it just felt right. Excitement swelled up in my belly and I took a quick deep breath to keep it at bay. "Don't fall in love, don't fall in love, don't fall in love" I kept telling myself, "Asante could definitely work for one more season if this isn't the one...Do. Not. Fall. In. Love. With. This. Boat." But, as we all know, matters of the heart are simply not controlled with the head (oh, if only it were that easy!) We both knew it, though. I don't dare say she was "perfect" but she was pretty dang close. She felt instantly like 'home'. I found it no coincidence that a copy of one of my all-time favorite books, "Don't Stop the Carnival", happened to be laying on what would soon become my side of the bed. The next morning as we were rushing out of our hotel to catch our flight home, I got a call from our broker (and longtime friend), Allen Schiller (best. broker. ever), letting us know that if we wanted the boat, we needed to move fast. One offer had come in and been denied earlier in the week, and another couple had a second viewing right after we did and were most likely putting together an offer as well. My gut told me she was going to go, and she was going to go quickly. I wanted it to be us. After a quick talk with Scott and Isla at our sleepy terminal in Hartford, Connecticut, we agreed to go for it. "Let's do it," I texted Allen, "Let's put in an offer". By the time we landed in Chicago, we were under contract. And thank god for it! Mere hours after we had a deal, another offer came in for 5K more than ours. Hours later! Talk about lucky. Timing truly is everything. Thankfully the owner was a man of good character and continued to honor our deal, but it was pretty incredible to think we were so close to losing this boat that is now our beloved 'home sweet home'. Sometimes, you need to move fast. She arrived a week before Christmas (Plug for fantastic human: if you need a delivery captain, look no further than the incredible Andrew Burton! He is not only professional and accomplished, but an awesome person to boot. As if that's not enough, the boat was impeccable when we took her over, he and his crew deep-cleaned her head to toe!) and we began the crazy process of moving from one boat to another. It was... nuts. There's really no other way to describe it. Moving house (or boat, rather) while simultaneously trying to make Christmas "magical" for our three kids was exhausting and stressful. Scott was working all hours trying to finalize the new online booking system for our business (much easier said than done!) and I was doing Christmas crafts, buying presents, and doing all the other stuff necessary to keep our home(s) in order. We pushed on and persisted, and in the end felt very lucky that our situation was about as ideal as could be: our new boat was docked next to Asante, we had plenty of time to move our personal effects from A to B, we purged a LOT of accumulated junk, and so many friends and family came to our aid to help us with the move and with the girls. All in all, we had it pretty awesome. Despite these perks, moving is no fun. Moving with three little kids nipping at your heels? 9th circle of Hell. PERIOD. So how are we doing in our new boat? We love her. I think I say how much I love her to Scott every single day. She has, indeed, been life-changing, just as I imagined her to be. Her name has a musical connotation and means "in a smooth flowing manner, without breaks between notes." In Italian, Legato means: tied together. I think it's a pretty nice name for a family boat, and we have no plans to change it. Partly because the name is not terrible, mostly because we're lazy. Her perks are great: she is much more roomy than our last boat and the addition of the third cabin has been everything we imagined it would be. WE HAVE THREE BEDROOMS!!! Isla has her own room now and she is positively ecstatic about it. The twins share the bunk room (although, despite having two beds they opt to both sleep together on the top bunk - how adorable is that?) and everyone has their own little space now. 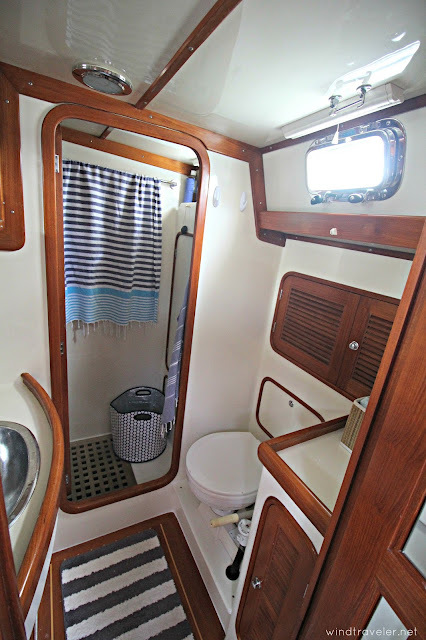 The addition of not only one, but TWO stand-up separate showers has also been life-changing; prior to this boat the girls and I would shower off the back deck with a cold water hose, and Scott would have to walk to the marina showers (no where near as often as necessary, mind you!) Not that big of an issue, and at the time it certainly didn't seem like a deal breaker - but being able to take warm showers on our boat and not on-deck has been truly AMAZING. The list of features that we love (centerline queen aft berth, an aft cabin that is large and spacious, a nav station that doubles as a desk...etc.) goes on and on...we love this boat. Love her. So what were our other desires when boat shopping this time around? We wanted a monohull under 50 feet, largely for cost reasons but also because if we wanted a ton of space we'd get a condo. 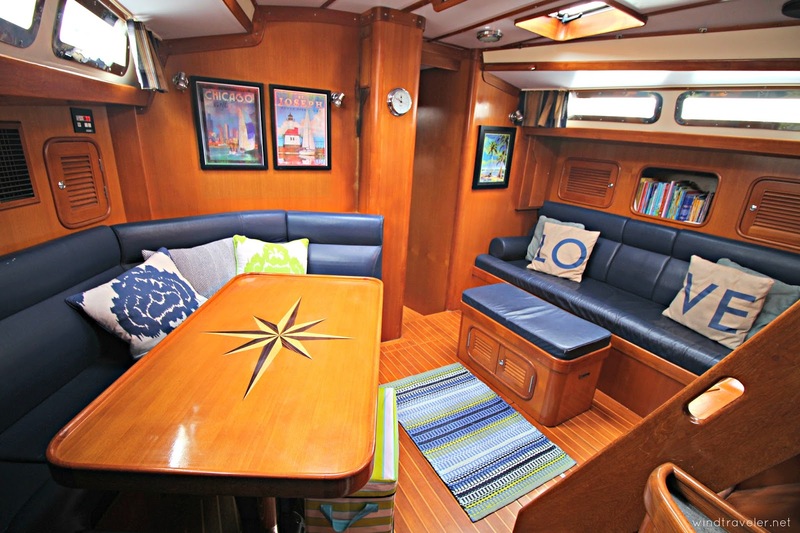 We like living "cozy" and we wanted to get the smallest boat that would give our family the space it needed to be comfortable. 48 feet worked out to be just right for us. Small enough to go anywhere and still be manageable, but big enough to give our growing family of five some individual space. 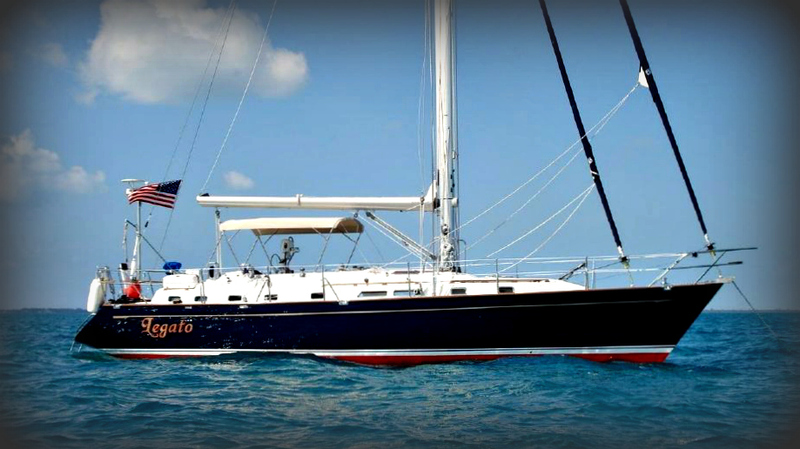 We wanted three cabins, an in-boom roller furling main, great sailing performance (she is a dream to sail!) 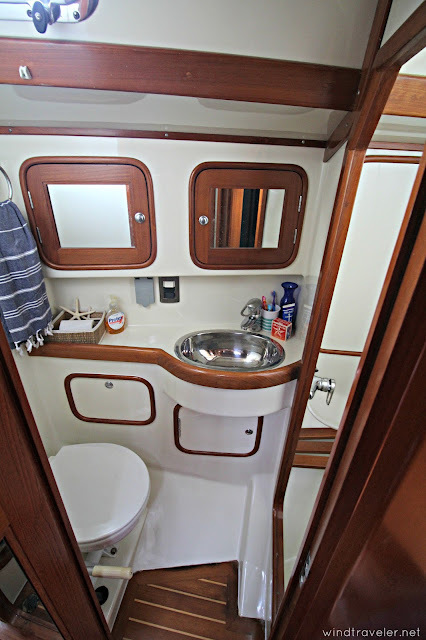 at least one separate stand up shower stall, two heads, an ample aft deck swim step, center cockpit configuration, cutter rig, and not a 'fixer upper'. 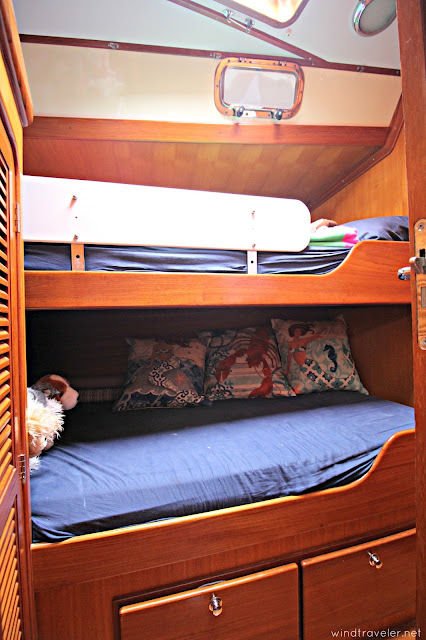 While this boat has done the Caribbean 1500 a few times, it's not at all set up for long-term live-aboard cruising which actually suited us fine. We are staying local for the next few years and while we eventually plan to cast off again, that's a ways away for us. By the time we get ready to shove off, there will be gear that is even better suited for long-term cruising than there is today. Off-grid systems and electronics get better and more efficient every year, so when our time to go approaches - we'll start adding things like solar power, water maker, davits and whatever else we think we need. For now, we're perfectly set up to be weekend warriors here in the beautiful Virgin Islands. And now, for the picture tour. We will start aft and then work our way up! 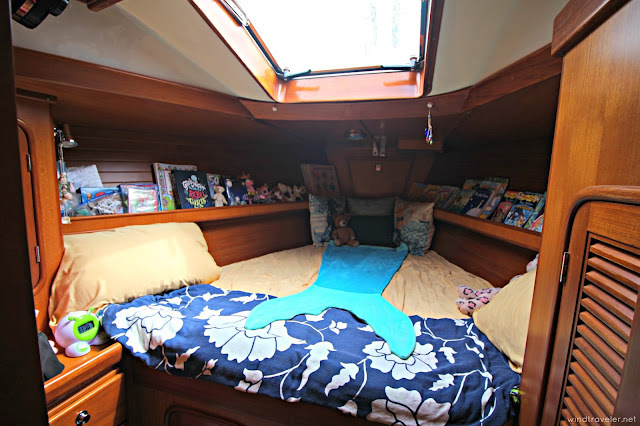 This is our aft cabin. It is a dream. 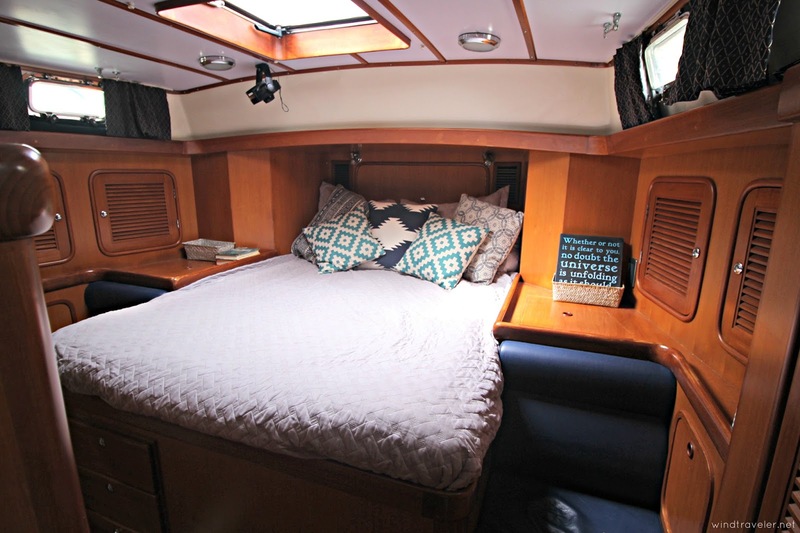 We love the headroom, the extra storage, and the centerline queen bed. Quite possibly the biggest upgrade of all, the aft head with a separate stand up shower. It is heaven! Our saloon. We still need to add some personal touches like family photos and such, but it feels very comfortable and homey. One thing I LOVE about this boat? It's so bright! Natural light is a must for me in a home of any sort, and we love that we get lots of it here. Another big upgrade! A desk! I write here, Scott works here and the chair is extra space for a friend to sit when people come over. 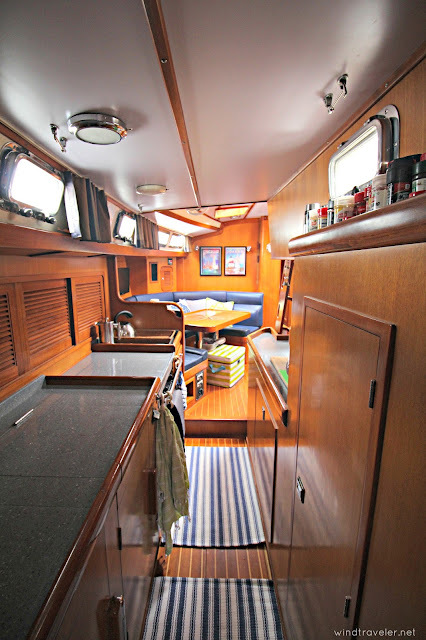 Looking aft to our bedroom from the saloon. Our walk-thru galley is a dream. The twins bunk room. Two beds and plenty of space to store their goodies, especially since they both sleep up top together. Scott and I designed the bedrail using L-brackets and starboard. Works like a charm! This is where the twins sleep, together. They sometimes sleep on opposite ends, sometimes snuggled up, but always together up here. Their choice! This is the forward head directly across from the twins' room. Also has a stand up shower. Love!!! Isla's room. This is her little sanctuary. She truly loves it and all three will play up here together in the morning. Books, books and more books! Looking aft from the front end. Our home sweet home!! We love her SO much! Here's the layout of our boat to help further the visual tour. Hope you enjoyed! 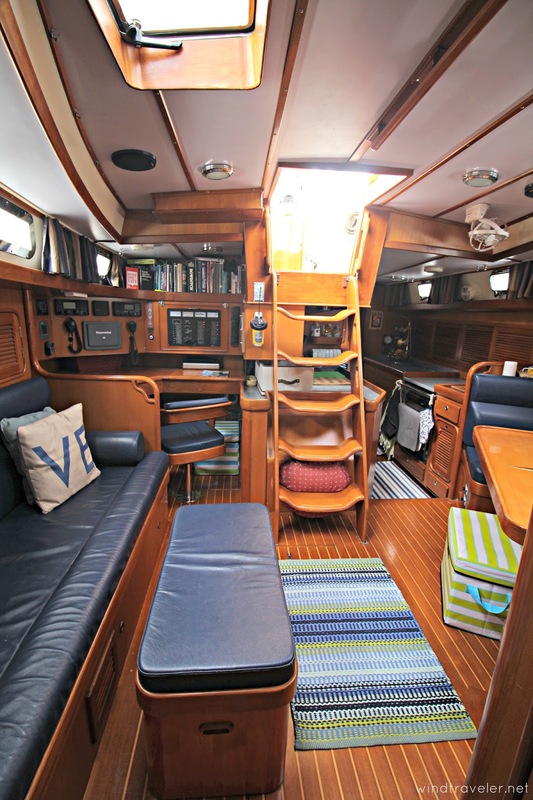 OUR OLD BOAT, S/V ASANTE (BREWER 44) IS NOW FOR SALE. STAY TUNED FOR A FULL LISTING WITH PRICE, PICTURES and SPECS. Great looking boat! I know you are happy with the extra room. CONGRATULATIONS, so happy for you!! 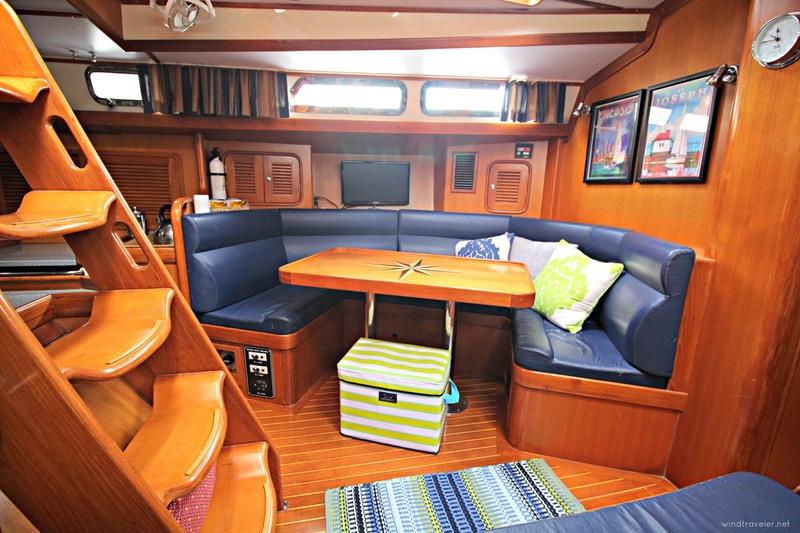 She's a gorgeous boat; sufficient space and privacy are priceless! Love it! Congratulations 😘Always find time to work on being a couple. What a wonderful boat! Truly magnificent and beautiful! I especially like the natural light flowing everywhere, it truly makes the difference. She looks beautiful! I love that you love her and can feel wonderful life changes already! I smiled as I read. Blessings as this part of your life journey unfolds! Gosh she really is a beautiful boat. I have boat envy, ours is pretty rough around the edges and we still haven't figured out how to sleep together yet. I love your ships in the night reference, sounds a lot like us of late. Life is hard, even on a boat. Hope to hang out soon, I may be hanging with Darcy in Sopers. Beautiful boat! A nice step up in room and comfort, too! Good on all of you. Very cool! 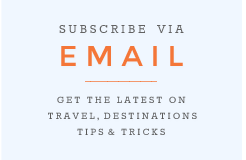 I've missed your blog for a bit as I moved to Colorado, bit I enjoyed reading of you upgrade! She is a beauty!! Crazy question: Where do you put your trashcan? We just bought a tayana 48 (two cabin layout) and I cannot find a good place for a trashcan anywhere! I am absolutely stunned to think this boat sunk during hurricane IRMA. I am happy to know that you, Scott and the little ones are okay. I read your blog about the aftermath and will follow your progress and know that it will be a daily journey. Brittany so sorry your beautiful and loved boat is now at the bottom of the marina, but you are so positive and inspiring, things will come good for your lovely family again. You will be even stronger, and an inspiration to everyone. Good luck to you all for the future.